You are currently browsing the category archive for the ‘Studio Ghibli films’ category. After several very fine films, like ‘My Neighbor Totoro‘ (1988) and ‘Princess Mononoke’ (1997), Miyazaki tops himself with his masterpiece ‘Spirited Away’. This film single-handedly places him among the greatest masters of animation of all time. The film depicts a strange and inexplicable, yet surprisingly complete fantasy world, with a conviction and originality that has rarely been seen since Lewis Carroll’s ‘Alice in Wonderland’. At the same time, unlike several of Miyazaki’s earlier films, one feels that ‘Spirited away’ could only have been made in Japan. Its setting of a public bath, with its numerous gods and demi-gods, is totally Japanese. Yet, its story about coming of age is universal as is its appeal. The little girl Chihiro (or Sen, as she’s called during most of the film) is the greatest of Miyazaki’s heroines. Like Kiki in ‘Kiki’s Delivery Service’ (1989), she matures during the film, but the fears and terrors she has to conquer are far more alarming than Kiki’s, and her growth is way more convincing. Not only has she to prove herself, she has to regain her name, and most importantly, she has to rescue her parents, who have been transformed into pigs in a particularly horrifying scene. At one scene we see her stricken with traumatic stress. In another we watch her breaking down. Despite some exaggerations (a flood of tears, for example), these scenes are so surprisingly real, they startle the viewer who’s used to the formalized emotions of many commercial animation films, whether Japanese or Western. However, the character animation of Chihiro is outstanding throughout the film: she is a true girl and not an adult in disguise, and her emotions feel genuine and seem deeply rooted in observation of real human behavior. We identify immediately with her, and she’s strong enough a character to make her extraordinary journey in that strange, mysterious and dreamlike world believable. Typical for Miyazaki, even in this hostile world our young heroine is not without friends, and even the most unpleasant characters (Yubaba and Without Face) are not without their weaknesses or positive character traits. On the other hand, even the good can look fearsome and unpleasant, as Yaku does in his dragon form. Also typical for Miyazaki is his depiction of children at work (see ‘Laputa – Castle in the Sky‘ (1986) and ‘Kiki’s Delivery Service’). On the other hand, his recurring theme of man versus nature is less apparent in this film, although it does appear in the form of a polluted river god. 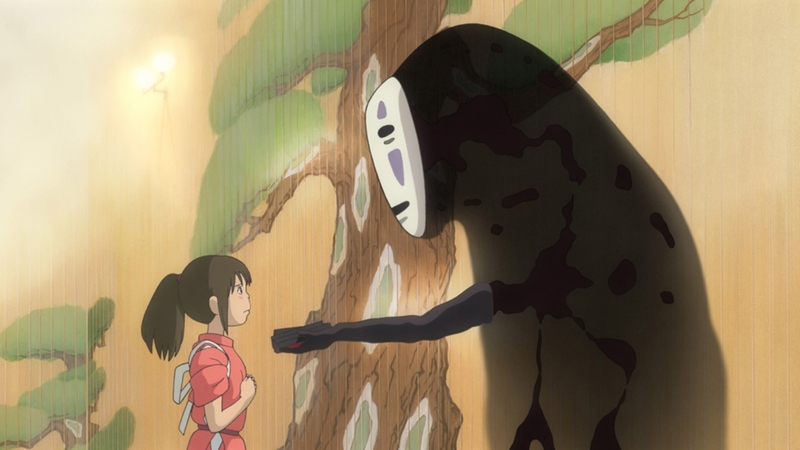 In all, ‘Spirited Away’ is a rich film of pure delight and will enchant everyone everywhere in the world. 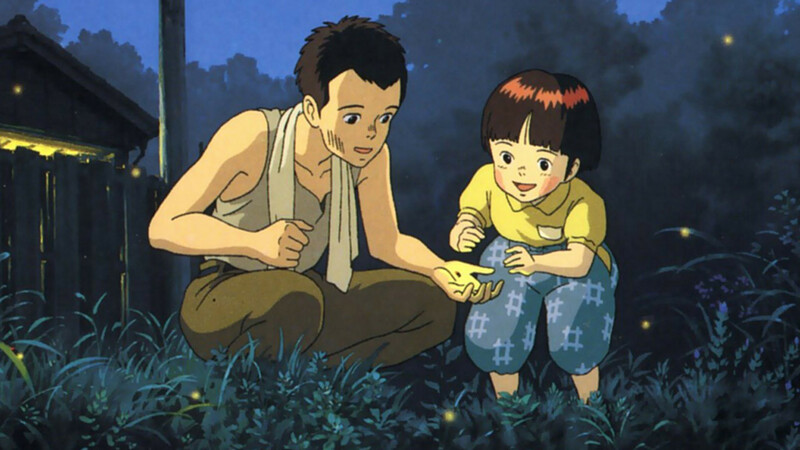 Set in the early post-war period, ‘My Neighbor Totoro’ is the sister film to ‘Grave of the Fireflies‘, released on the same date as a double bill. The film is a way more lighthearted affair than ‘Grave of the Fireflies’, however. With ‘My Neighbor Totoro’ Miyazaki definitely entered the children’s world, which he had already explored a little in ‘Laputa: Castle in the Sky‘ (1986). But where the latter film firmly puts the children into an adult world, in ‘My Neighbor Totoro’ Miyazaki explores the children’s world itself. The film focuses on two little girls: ca. eight year old Satsuki and her sister, four year old Mei. They move with their father to an old ramshackle house in the countryside to be near the hospital where their ill mother is staying. In a giant camphor tree next to this new home Mei and Satsuki meet the Totoros, three forest spirits: a tiny one, a small one and a huge one. When Mei gets lost, the giant Totoro and a cat bus help Satsuki to find her. ‘My Neighbor Totoro’ is a delightful film for children and their parents. There’s no conflict or villain whatsoever, and even when there seems to be drama, when the two children think their mother may be dying, there’s really little to worry about. But like in ‘E.T.’ (1982) we share the children’s point of view, in which there really is a problem. ‘My Neighbor Totoro’ draws us convincingly and irresistibly into this magical world of children. 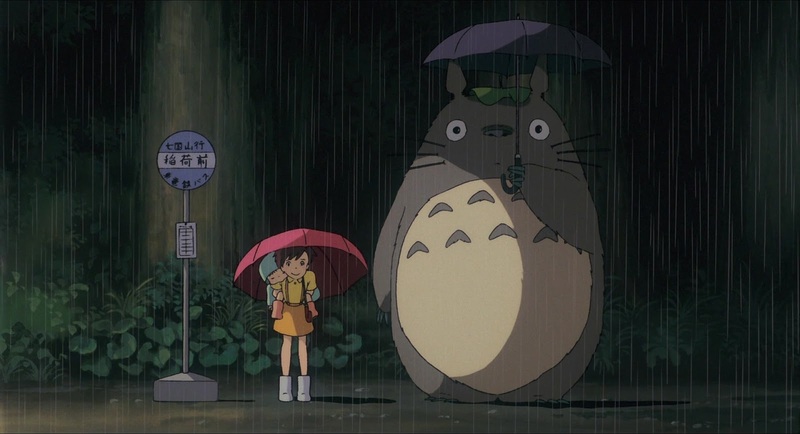 The film knows no dull moments, and is full of wonderful scenes, the best being Satsuki, Mei and the giant Totoro waiting for the bus in the pouring rain. Its strong focus and perfect execution makes ‘My Neighbor Totoro’ arguably the best of all Studio Ghibli films. At any rate ‘My Neighbor Totoro’ is a gem even among Miyazaki’s films, which are of a constant high quality throughout. He must have felt so himself, for it’s the large Totoro which gave the Ghibli Studio their studio icon. Drawing inspiration from Jonathan Swift’s ‘Gulliver’s Travels’, ‘Laputa, Castle in the Sky’ takes Miyazaki’s love for flying machines to the max, introducing a humongous flying island. Its story is set in a parallel world, which has a genuinely late 19th century European feel, but where flying machines are very common. The strange machines imagined for the film are both wonderful and convincing. We follow the two orphan children Pazu, a poor mine worker, and Sheeta, who falls from the sky carrying a mysterious amulet, which reveals that she’s a Laputan princess. Followed by the Dola clan, a gang of pirates led by an old pink-haired woman, and by the military led by the enigmatic gentleman Muska, the children seek out to find the flying island. Unlike other films by Miyazaki, ‘Laputa’ knows a real villain, the ruthless prince Muska. While the children admire Laputa for its nature, and while the pirates and the soldiers are only after its treasures, Muska seeks the island’s destructive possibilities to obtain world power. On the way, the film moves to a grander and grander scale, with a finale on the floating island that shows us dazzling heights, and which doesn’t eschew many killings, making ‘Laputa: Castle in the Sky’ Miyazaki’s most violent movie. 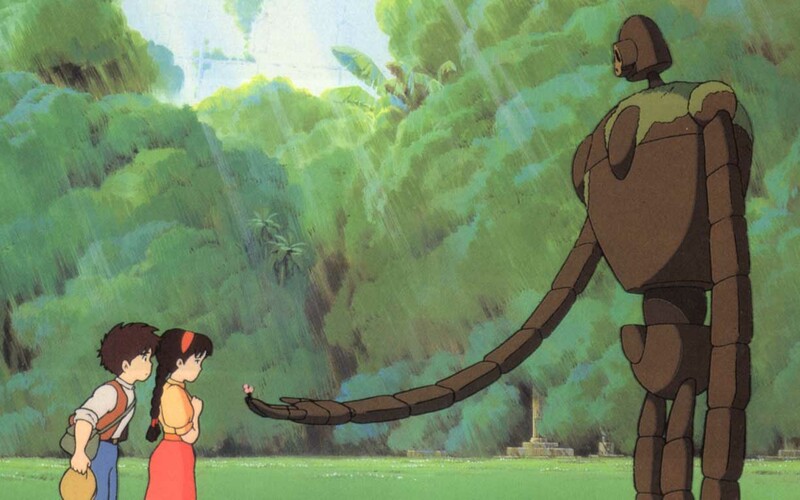 ‘Laputa: Castle in the Sky’ is Studio Ghibli’s very first feature film. It’s akin to the earlier ‘Nausicaä of the Valley of Wind‘ (which predates the studio’s foundation) in its focus on the importance of love and nature and its aversion to short-minded people only interested in power and destruction. Despite its violent finale, ‘Laputa’ is more overtly a film for children than ‘Nausicaä’. Its focus stays with the rather naive children, and it contains more humor, especially in the depiction of the pirates, who are almost used as a comic relief only. In any sense, ‘Laputa’ is a powerful film: its depiction of an original made-up world is convincing, its animation is outstanding, and its message complex and far from black and white. It once again shows the mastery of Miyazaki and the Ghibli studio. Although the titles say ‘based on the graphic novel’, the manga of the same name was actually created to be able to make the picture. Based on his own original story, ‘Nausicaä of the Valley of Wind’ is Miyazaki’s first mature film. It’s already a typical Miyazaki film, with its strong environmental message, strong female characters, the absence of clear villains, and the setting of an alien, yet totally convincing world. 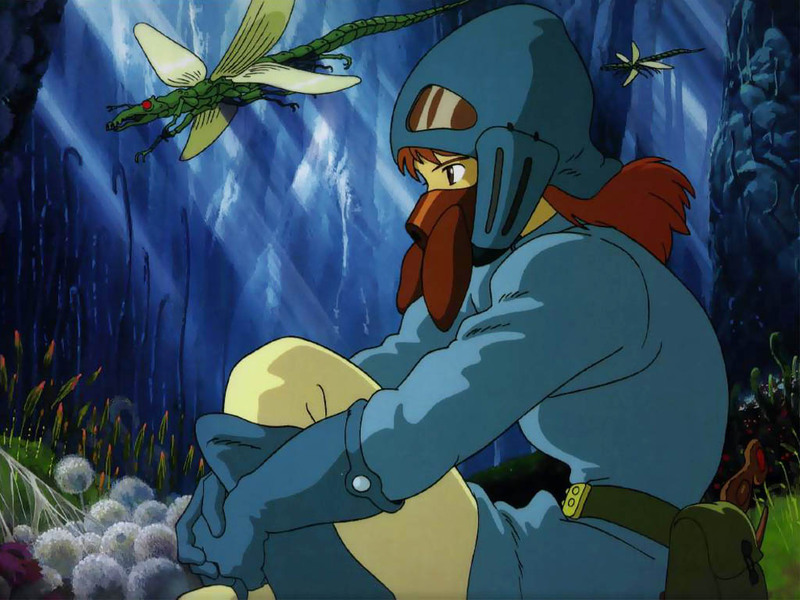 The film tells of Nausicaä, princess of a small medieval-like state in a green valley, which is threatened not only by the strange, hostile and poisonous insect world nearby, but also by other human states, especially the militaristic state of Tolmekia. The humans are more preoccupied with destruction than with comprehension. Because of this shortsighted and drastic behavior, the humans almost destroy their entire environment. It is Nausicaä, with her unique understanding of animals and her pacifistic nature, who saves the day. ‘Nausicaä of the Valley of Wind’ is an epic science fiction film, made on a grand scale, with layered characters, beautiful designs, and excellent animation. Its production led to the foundation of the Ghibli studios, which high quality standards it already meets. In no sense it feels like a first-born or a dated film. Even though it’s from 1984, it is remarkably fresh and its message still viable. In other words, ‘Nausicaä of the Valley of Wind’ is the first of a long series of Ghibli studio classics.